First Paragraph - First Chapter - Tuesday Intro is hosted by Bibliophile By the Sea. So for this book meme, I just have to post the first paragraph of the first chapter of either a book I am currently reading or about to start. 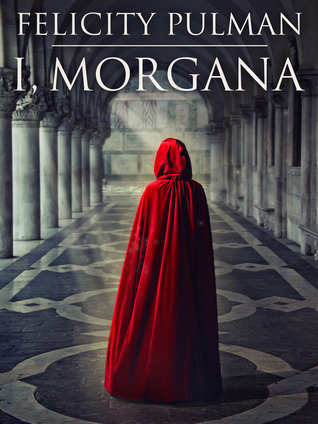 I'm going to be focusing on a book which I am planning to start soon - I, Morgana by Felicity Pulman. I received the book through NetGalley in return for an honest review. A couple of my Goodreads friends read it and didn't think much of it so I'm not sure what my experience will be with it. Only time will tell! At least it's a pretty short book. "I am an old woman now. My bones creak and scrape together like bare branches in a winter wind. I ache with longing for my youth. When I notice my reflection, I am aghast at the vision of the hag who looks back at me. I mourn the passing of who I was, and everything I could have been. More than anything, I long to reverse time. Throughout the years I have tried and tried to do this, without success. Now, even my most potent spells and incantations cannot transform me into the young woman I once was, with all my life still to live. With age, my magical powers have all but deserted me. Once I was desired by men; now I am disregarded by all and loved by none." Teaser Tuesdays is hosted by Miz B of Should Be Reading. So for this book meme, I have to randomly turn to a page (or two) and choose a sentence to post here to tease you all with. I'm combining the two book memes and using the same book for both. Today I'm featuring Five Days Left by Julie Lawson Timmer. I like the opening and the cover is striking, so I'd give it a little more time. It's too bad the book isn't getting better reviews from your friends. :-( I like the intro though--it makes it sound promising. I am not a huge King Arthur fan, but I love stories about Morgana, especially when she's portrayed as a sympathetic character. "my bones creak and scrape together like bare branches in a winter wind..." wow! Love her phrasing, and that sounds like me, lol, with my disability-- though I'm not old like her. I would read this at least far enough to know more of the plot. I think I would read a bit further, but I would probably continue. I like the cover too. I would need to read on a bit more to decide. I'm an old woman and my bones don't creak and scrape together. It doesn't happen to any of my friends either. I suspect this is a young author who has stereotypes in her head rather than true experience. Sorry. The first paragraph turned me off. love the cover! has my interest!